What are people looking for? Let’s be honest we are looking for lots of things. Material things. Self-confidence things. Adventurous things. Spiritual things. Emotional things. Career things. Health things. Lifestyle things. The meaning of life? What are people not looking for? In reality, most people are not searching for God, not even in the hunt for answers to spiritual matters. This is usually more about living a life that matters, being right with people and not holding grudges. The best place to live the fulfilled kind of life is from a place where God is at the centre of every matter in our life. Living such a life is the life God designed us to live and He is on the look out for such people. 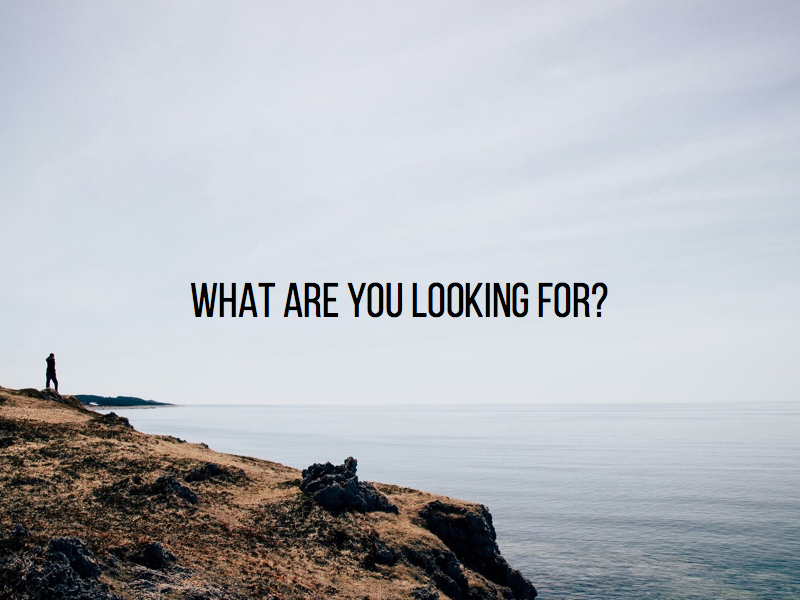 What are you looking for? LOOK FOR GOD. When we do so with an open heart, a willingness to discover Him, then we will find Him and we will realise that God has had His eye on us all the time. He loves you. He is for you. He has given everything for you. He wants you to know Him. He wants to be involved in every aspect of your life. He is good. He is faithful. He is with you. This week, let’s take time each day to focus on one of these incredible truths about God, thanking Him for being this and inviting Him in to all the different things going on in our life.